A spectacularly preserved creature, dubbed Lyrarapax unguispinus, was unearthed in China. The 520-million-year-old sea creature was so well-preserved that parts of its brain and nervous system were clearly defined. A spectacularly well-preserved sea monster that once prowled the oceans during the Cambrian Period has been unearthed in China. The 520-million-year-old creature, one of the first predators of its day, sported compound eyes, body armor and two spiky claws for grabbing prey. The fossils of the new species were so well preserved that the nervous system and parts of the brain were still clearly defined. Before the Cambrian Period, which lasted between 543 million and 493 million years ago, most life resembled simple algae and stationary jellyfishlike creatures, but during the Cambrian explosion, a period of rapid evolution when biodiversity exploded, swimming sea creatures with compound eyes, jointed legs and hard exoskeletons emerged. The period also saw the rise of an iconic group of shrimplike creatures known as anomalocaridids. These ancient sea monsters were the top predators of the Cambrian seas, and sported bladed body armor and a cone-shaped mouth made of concentric plates. Some of the biggest of these bizarre creatures could grow to be up to 6 feet (1.8 meters) long. 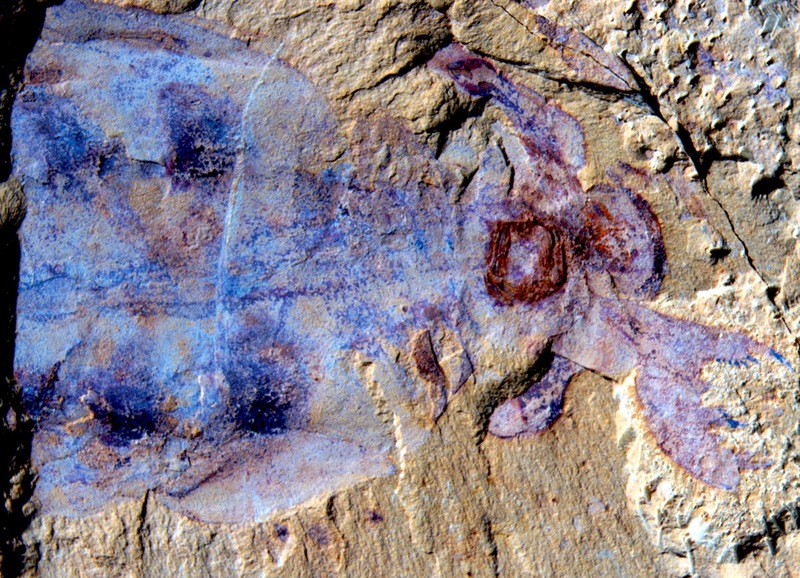 But most anomalocaridid specimens paleontologists found have been poorly preserved, making it difficult to know precisely where they fit in the tree of life, said study co-author Peiyun Cong, a researcher at Yunnan University in China. Some scientists thought anomalocaridids belonged to a group that split off before the most recent common ancestor of all living arthropods, while others thought the animals were part of a group called chelicerates that includes spiders and scorpions. Still others thought anomalocaridids had converged upon similar features to those of modern arthropods but didn’t evolve from the same lineage, Cong said in an email. In the last several years, the researchers unearthed three spectacularly preserved specimens of a new species of anomalocaridid in fossil sediments in China. The sediments had frozen these creatures in time so perfectly that the entire nervous system, as well as the gut and some muscles, were still visible. The creature, dubbed Lyrarapax unguispinus, was about 6 inches (15 centimeters) long. “The three known specimens may represent immature stages of the animal, so it might be larger,” Cong wrote in an email to Live Science. L. unguispinus had a tail that looked a bit like that of a lobster, and two giant pincers for grasping prey. As it grew, the creature molted, shedding its outer cuticle. Based on its brain, which lacks some of the characteristic features found in chelicerates, the creature likely shared more similarities with a group known as velvet worms, Cong said. Still, the new results can’t pinpoint where on the tree of life these ancient sea monsters go, Cong said. But no matter what group they belonged to, by the end of the Paleozoic Era, about 251 million years ago, the last anomalocaridids went extinct, Cong said.